About a month ago Olive, our cat, drug a dead bird into the house through her cat door. After chasing her around and eventually under the bed, I got the bird away form her and gave it a proper burial…in the garbage. I had assumed that she found the bird dead in the yard because she isn’t much of a hunter. Well, I guess I was wrong , because this afternoon Gillian, Elena and I where hanging out in the living room and we heard this strange squeaking sound as Olive proudly marched into the room with a live, full size, bird in her mouth. Of course the bird got loose and started fluttering around the house with Olive in pursuit, jumping, pawing, and biting at the poor bird. I tried to direct the bird outside but failed because I was in tears with laughter. Olive finally manager to knock the bird down onto her cat perch and it stopped moving. I wrapped it up in a towel and took it outside to through it into the field next to our house. As I unwrapped it, the bird woke up and flew away. Though based on the amount of feathers and “bird bits” in our living room and kitchen I don’t think it is long for this world. Oh and the bird emptied it’s bowels on our coffee table, but I still find this all hilarious! UPDATE: Olive caught another bird and brought it into the house yesterday over lunch and again this evening while we were having dinner! 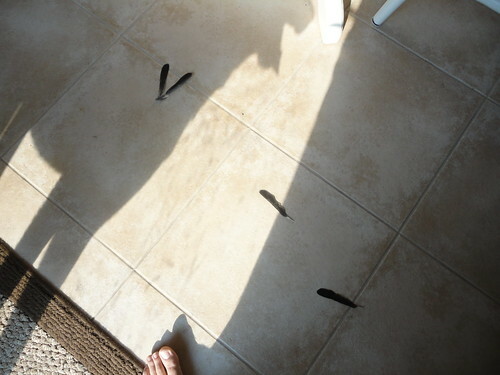 That is three birds in three days, these must be the stupidest birds in the world! We also really need to start shutting the garage door. This entry was posted on June 8, 2011 at 2:00 am and is filed under Animals, Failure, WTF!?!. You can follow any responses to this entry through the RSS 2.0 feed. You can leave a response, or trackback from your own site.